In case you missed it—which you probably did, since the Christophobic guardians of our democracy in mainstream media ignored it—below is President and First Lady Trump’s Christmas greeting from the White House. Now, let’s think about this for a moment before dismissing it as a lot of political theater. First off, President Trump is not a Catholic, so there’s no pressing need for us to go over this thing with a fine-tooth theology comb to see how it jives with the Summa. Donald Trump has never been mistaken for a theologian, and likely never will be. For Christians all across our nation, around the world, this is a sacred season that begins 2,000 years ago when Jesus Christ was born. An angel declared to the shepherds tending their flocks, “Behold, I bring you good tidings of great joy, which shall be to all people. For unto you is a born this day in the city of David a Saviour, which is Christ the Lord.” There in Bethlehem, Mary and Joseph held in their hands the son of God; the light of the world; and, through Him, the promise of eternal salvation. The inevitable objection to this touching presidential greeting is as predictable as tomorrow’s sunrise: Trump doesn’t mean a word he’s saying! Perhaps. But how does one go about proving this? At best his critics can say it’s improbable, given his past, but even this requires a judgment against the man with which Sister Mary Carrol back in sixth grade catechism would certainly have taken issue. So, Trump may not mean a word of this, but, then again, he may. We really can’t be sure. The Lefty lunatics surely think he means it. They’re out there smashing up Starbucks right now, convinced that Trump is a pro-life Christian. And I wonder what’s to be gained from any of us getting all worked up trying to prove them wrong. Isn’t it more fun to just let the Left huff and puff over Baby Jesus being recognized in the White House as the Son of God? I honestly don’t know what motivates the traditional Catholic Never Trumpers. Even if Trump “doesn’t mean a word he says” in these addresses, what about the fact that he went ahead and said that he does? Would they prefer to see him say that he doesn't believe Jesus is the Son of God? I'll settle for presidential lip service (if that's all it is) which warms Christian hearts and reminds the whole world Whose birthday we celebrate every year on December 25. I'll settle for presidential lip service (if that's all it is) which enrages all the right people, too, i.e., the Christophobes, the Soros bearded ladies, the Clinton cuckoo’s nest—the whole gaggle of Leftist weirdos in that Star Wars barroom known as the Democratic Party. The leader of the most powerful country on earth is acknowledging Jesus Christ as the Son of God. Doesn’t that count for anything? It seems to me that it does, or at least it should. Even if Trump is just “playing the God card”, don’t Christians win when it suddenly becomes politically expedient for the POTUS to pay homage to Jesus Christ at Christmastime? Remind me again: What are we whining about? Read the last Remnant Newspaper of 2018 right now! If this is all "just politics" and Trump thinks he needs the Baby Jesus's help to get himself reelected, shouldn't we still be thanking God for it? And let's not forget the other pretty vital point here: The President of the United States just reverently spoke the Name of Jesus Christ to a worldwide audience. This is not insignificant, the Name itself having the power to alter the course of human history, move mountains, force even the demons in hell to genuflect at its every utterance. More than anything else, this country--this whole world--is in desperate need of a reminder of Who Christ is and why all mankind must call upon His Name now, before we blow ourselves to hell. 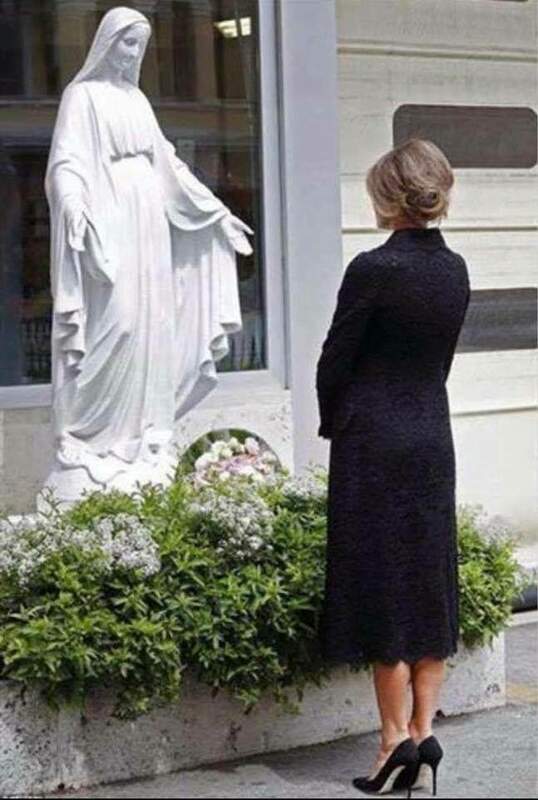 Trump is not a Catholic. He does not understand the doctrine on the Kingship of Christ. But in his own way, he's buying time for the Catholic revival to get its act together while helping to wake the sleeping Christians. Sounds rather like George Soros's wake-up-screaming nightmare in action. Our ageing and embattled President well could be turning to Christ according to his limited and Protestant understanding of what that means. He’s not a fan of lawlessness; he knows that lawlessness and disorder become inevitable in a society that recognizes no God. America doesn’t work without God, and Trump obviously wants America to work. The New World Ordernarians hate him precisely because Trump wants America to work as much as they need America to fail. For one-worlders like Pope Francis or George Soros, Donald Trump--despite his faults and failings--is a walking, talking, tweeting monkey wrench. Certainly, he stands with those who very much want the President of the United States to stand with Christ. That's why they hate him over at Christophobic enclaves such as CNN. It's not the prospect of Trump's colluding with Russians that's got them pulling out their hair plugs and rending their onesie business suits. No, it's his open "collusion" with Christians, with us, with God-fearing Americans. Nevertheless, some will listen to Trump's words and be quick to point out that since Trump used to run with liberals and progressives, we're being terribly naive to take seriously his nice words about Jesus Christ. On the other hand, consider how President Trump must be reacting to the bizarre antics of his old cronies who've since morphed into Trump-hating, Melania-bashing, hydra-headed demons that will stop at nothing to destroy him and his entire family. Would it really be so unthinkable for their witch hunt to be pushing the man our way? He's got himself pinned down in one helluva storm, and Christian Americans have got an empty port. The question should probably be: Why wouldn't Trump come our way! Bottom line is this: Whatever you think of Donald Trump, at this moment he is hated by anti-Christians for siding with Christians---the basket of deplorables, the pro-lifers, the pro-family folks that elected him and for whom there is no place at the table of the New World Order. If we don’t see an opportunity here, that’s on us. Every day, Donald Trump is forced to juxtapose the Godless with the Godly, the Christians with the anti-Christians, the faithless with the faithful…. And we’re incredulous when he suddenly decides to side with us over the hounds of hell that are screaming for his blood? The followers of Jesus Christ are Trump’s best friends in the world right now, and he knows it. When he pays homage to Jesus Christ he's empowering and emboldening Christians--and the enemies of our God and country know it. If anything, after having looked into the beady little red eyes of his political opponents -- legion in Hollywood, Media and Politics -- it would be surprising indeed if Trump didn’t say something to bring Christ back to the White House and God back to America... and mean every word of it. Pray for President Trump. Pray for his conversion. Pray for his protection. Demons want him to fall for a reason. If he loses in 2020, Hell wins in 2020—and for all of us there’s going to be hell to pay for that. So whatever we think of Donald Trump the man, it behooves us to pray that Donald Trump the president fares well in the next election. Looking at the demons lining up against him now, not only our freedoms but our lives may depend on it. And in any case, regardless of motives (which we can never know), God bless President Trump for saying what must be said. Christian Americans will stand with him so long as he stands with them against those who hate Christ the King, Savior of the World, Who was indeed born in Bethlehem over two thousand years ago and Who still reigns over the world today--whether the anti-Christians want to asknowledge Him or not.